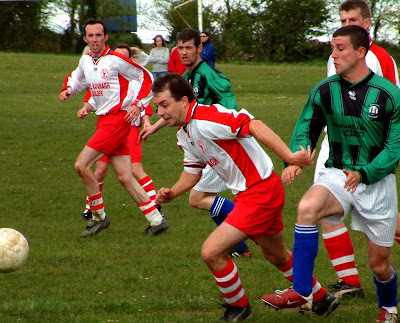 Village United scored late in the first half, early in the second, on their way to a 2-1 win over Silverheights visitors Killumney United (white tops). Killumney, who had seen Golden Boot contender James Fleming hit the post with a 61st minute thunderbolt, scored late on but it wasn't enough to save their own promotion hopes. That second automatic promotion place now rests between Village and Coachford with Village the slight favourites to join Premier A champs Glencairn in the Premier League next season. 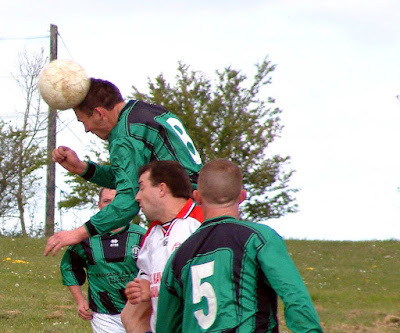 Village despite their recent strenuous campaign, started the brighter of the two on Saturday last and, just six minutes in, leading scorer Richard Burns volleyed just wide as a long clearance by keeper Jamie O’Donovan dropped for him. In the 15th minute, keeper O’Donovan belted a quick free kick right upfield to Conan Burns who crossed to Brian Sheehan but he hesitated and Colin Cronin got in a tackle and conceded a corner. 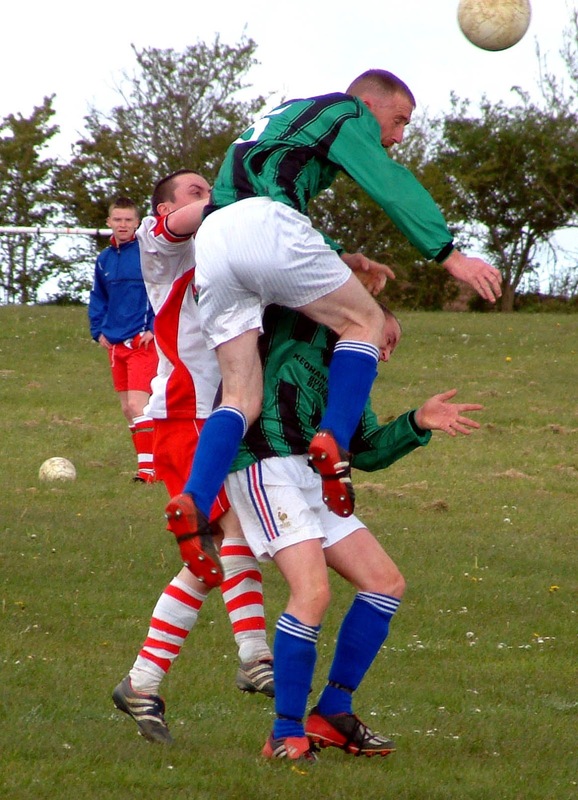 Seconds earlier, Killumney keeper Niall Corkery had saved well from Conan. Killumney too had their first half chances. In the 19th minute, Evan Mohally beat the offside trap but centreback Conor Jones raced across to cut him off. In the 30th minute, James Fleming got away from Jones for once but dragged his shot wide of O’Donovan's right hand post. Conan Burns soon had another chance for Village, this from a fine pass by Eric Burns, but full back Kevin Hegarty nipped in to concede a corner. In the 43rd minute, a long free by Village’s James McNamara, up from the B team, found the head of Alan O'Brien but his effort was a few feet over the bar. Better luck for Village in the next minute. 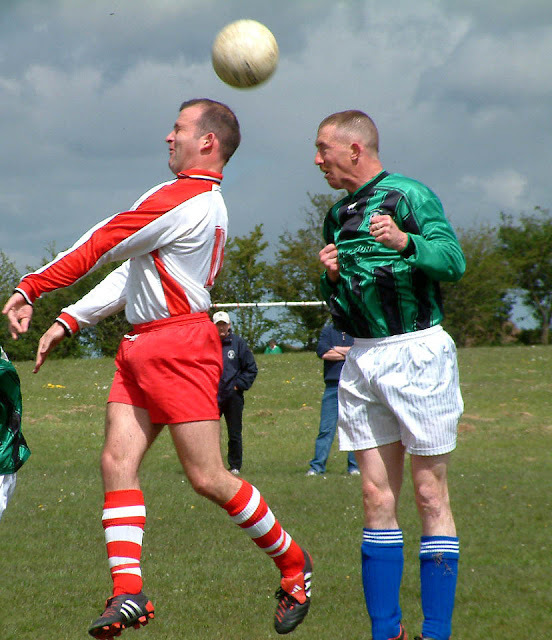 A superb long pass by Kevin Dunne unhinged the visiting defence and got Richard Burns in to cross. He found Sheehan at the far post and he forced the ball past Corkery. It was an untidy goal an indeed generated some dispute about whether the ball had crossed the line or not but there was no untidiness, no dispute, about the second Village strike five minutes into the second half. Killumney might well have been level by then as Colin Cronin beat a posse of players to get a near post header to Vince Ahern's free but he put his effort over and then a 25 yard free by Village fullback Dunne was well held by Corkery. Corkery though had no chance with the second Village goal. Colin Cronin got his head to an incoming Village free but was under the ball and didn't get much length on the clearance. 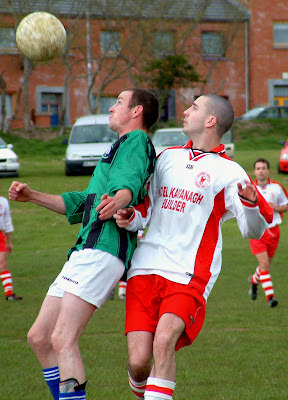 It fell to Conan Burns and his smashing volley sped through the crowded area and into the back of the net. Village came close to killing it off in the 54th minute. Eric Burns made a terrific run and his cross was half-cleared to Alan O'Brien but his powerful drive flew just over. The Killumney management weren't hanging around and made two switches, the second of which saw keeper Corkery move up to a familiar striker role. But it was Golden Boot contender Fleming who almost halved the deficit in the 61st minute. Then he fired in a 25 yard free kick and it looked good but hit the outside of O’Donovan’s left hand post and went wide. 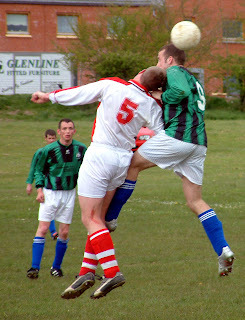 Despite some intelligent probing by Vince Ahern, Killumney weren't really putting enough pressure on the home defence. Indeed, Village should have wrapped it up about the 76th minute when Richard Burns had two chances in rapid succession. But the first, a shot, was directed straight at sub keeper Aidan Griffin and the second, a close range header, was just off target. Killumney finally got one back in the 82nd minute and ex keeper Corkery played a part. He picked up a through ball by Ahern and crossed for sub Michael Sugrue to fire home from close range. Killumney kept plugging away and had their last chance with about two minutes to go. An Ahern free led to a corner, which he took himself. He found Sugrue but his header was well off the mark and Village were left to face the final week of their season with the coveted prize of promotion still in their own hands.